"Evaluting and Selecting the Right ERP System For Your Organization"
Selecting, installing and implementing a new ERP System may be the toughest business challenge you face because the results of the process are so critical to your business. There are many common methods people use when trying to select the ERP software. Some of them work well, others don’t. This whitepaper discusses some of these techniques based on what your priorities are in selecting an ERP software to solve challenges and exploit opportunities. Level of Support from the Solution Provider. Vendor’s Track Record of Performance. Software’s Ability to Fit the Business. Growth Potential of the Software. 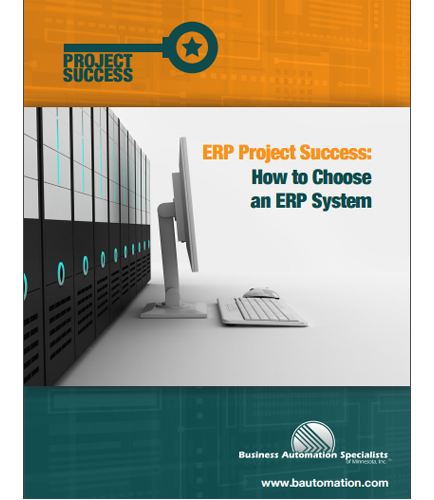 Download this whitepaper for a closer look at the steps involved in evaluating and selecting the right ERP system for implementing automated business management system that can meet the unique requirements in your organization.